Changing my major from Computer Engineering to Computer Science at the beginning of my sophomore year of college meant that I was in the Arts and Sciences college instead of College of Engineering. Not much changed, except that now I had a two year language requirement. I was actually pretty excited about this, as I've always wanted to master a foreign language, and now I had a good reason. Two years of learning a foreign language is a big time commitment, so I wanted to choose something that would be useful and also enjoyable. The only language that really stuck out to me was Chinese because it's difficult, interesting, and I think it sounds musical. My friends thought I was crazy but I like a challenge. My university's first Chinese class wasn't offered in the spring, so I decided to take a class at the local Confucius Institute to see if I liked it before I comitted. I waited weeks in anticipation for my first Chinese class and watched a few beginner videos about Chinese. I knew it would be difficult, slow, and embarrassing at first, but figured I'd be in a class full of people who are also starting from scratch so we would all be in the same boat. I showed up to my first class ten minutes early and nobody else was there. As the clock kept ticking, I was still the only one sitting in the classroom. When the teacher came a minute before class started, she told me I was the only person who had signed up for this class's time slot. Being the only one who shows up to a class was more awkward that I had ever imagined. For the next hour and a half she taught me pronunciation and it was far more difficult than I had anticipated. To pronounce some of the sounds in Chinese, you actually have to hold your tongue and mouth differently than in any sound in English. I was embarrassed and shy, but after that first class I knew I would love learning Chinese. Once I got over the hump of getting used to pronunciation and tones, it was actually a lot of fun and I really enjoyed studying and practicing. Taking those classes last spring gave me a boost this fall when I began the first year of Chinese classes at my college. The hardest part about Chinese is probably the tones. Unlike English, Chinese is a tonal language and has four tones plus a neutral tone. Changing the tone changes the whole meaning of the word. For example, mài (卖） and mǎi （买） mean to sell or to buy, depending on the tone. If you mess up the tone while you're asking a question (wèn - 问), you might accidentally ask for a kiss (wěn - 吻. It's difficult for people coming from a non-tonal language to get used to pronouncing tones, and even then, it's hard not to sound "flat." Even without tones, pronunciation is difficult for beginners. Many of the sounds sound exactly the same to our untrained ears, such as "q" and "ch", "x" and "sh", and "j" and "zh". Even after a year, sometimes I still have a tough time distinguishing between them while speaking or listening. If you've never learned a foreign language before, something you might not take into consideration is that you actually have to learn how to listen. Listening to Chinese and being able to pick out the words and meaning takes time. Even just listening to words and picking out the tones is difficult for beginners, especially coming from a non-tonal language like English. Chinese has a writing system that is based on characters, so you can't sound a word out while reading or writing. Different parts of the characters have different meanings, so that helps a bit. The pronunciation of a word can be written in pinyin, which is the way of writing Chinese words using the alphabet, but is pretty much only used for learning purposes. Pinyin is actually the most common way of typing out Chinese characters on a keyboard. Each character is one syllable, and words can be made up of one or more characters, so while reading Chinese it's sometimes difficult to tell where one word ends and another begins because there are no spaces between the characters to separate words. However, I think writing in Chinese characters is fun because it feels like I'm drawing pictures instead of writing. A picture I took when practicing writing characters. Once you get accustomed to the tones and the characters, learning Chinese actually isn't so bad. Chinese is a language that has a steep learning curve at first, but then it gets much easier. The grammar is super simple, unlike English. For the most part, the sentences are Subject+Time+Place+Verb+Object, and there aren't a million exceptions to every rule. To my programmer brain, it seems very logical, although strange at first. After completing two semesters of Chinese classes at my college, I'll already know 75% of the grammar. Since words are oftentimes made up of two or three other words/characters, picking up new words gets easier and easier as time goes on. For example, airplane, 飞机，is "fly machine," bok choy, 白菜， is "white vegetable", computer, 电脑， is "electric brain", and so on. Some Chinese words are called "borrowed words," which means they actually came from English. For example, the word for coffee, 咖啡，is "kafei." These are the notecards I make for new vocabulary I learn in class to help me study. I've also picked up some additional words not included in these notecards. My teacher says we have learned about as many characters as a Chinese third grader! 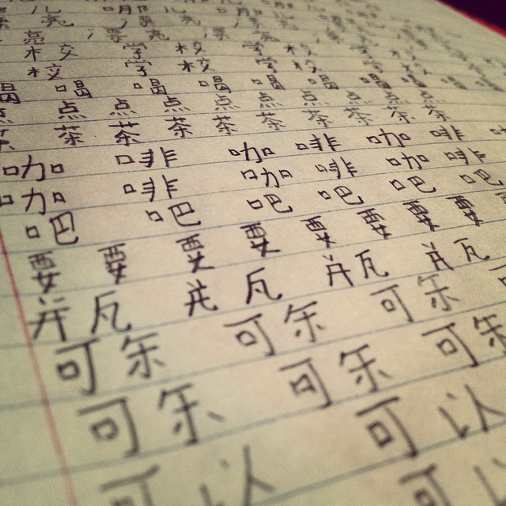 Not only is learning Chinese a fun hobby and a nice break from my computer science and math courses, but I also feel like it's opened up my world a bit. I have learned so much about Chinese and Taiwanese culture that I never would have considered before. I've met many other people who can speak Chinese (native and non-native) that I wouldn't have ever talked to otherwise. Not to mention learning a foreign language is good for your brain. I really feel like I've gotten more bang for my buck by learning a language that's so different from English.